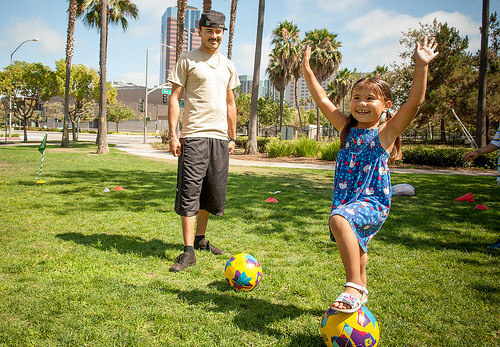 In a milestone step forward for Best Start Communities, First 5 LA's Commission recently allocated $413,033 for the City of Long Beach to work in collaboration with the Best Start Central Long Beach Community Partnership to implement strategies and activities identified through the "Learning by Doing" (LBD) process. The focus of the LBD process is to strengthen the capacity of the 14 Best Start Community Partnerships through the implementation of results-focused strategies and activities. Best Start Central Long Beach is the first of 14 Best Start communities to implement strategies and activities designed to achieve the core results of the Building Stronger Families Framework, which maintains that if families are strong and communities support families to succeed, then children will be healthy, safe and ready for school. In particular, the City of Long Beach will work with the Best Start Central Long Beach Community Partnership to improve family capacities by building parent leadership abilities and strengthening existing collaborations across systems related to home visitation and child abuse prevention. Each of the 14 Best Start Communities is working through the LBD process to identify core results within the Building Stronger Families Framework. Through the implementation of results-focused actions, Community Partnership members within and across the 14 Best Start communities will improve their collective knowledge and skills to address complex community conditions in a focused, integrated and strategic way. While Best Start Central Long Beach’s core result is to decrease child abuse and neglect in the 0-3 population, in Metro LA, the focus of the Community Partnership’s LBD process is on improving social connections by promoting a culture of respect which will be accomplished by identifying and understanding family and community values that impact family interactions. In Panorama City, the Best Start Community Partnership will work to improve social connections by providing opportunities for immigrant parents to make connections with other parents and learn how to find information and services to help families raise young children. In Palmdale, the Best Start Community Partnership is focused on leadership development and establishing concrete supports to raise awareness among parents of existing child care, preschool and educational services. In the coming months, First 5 LA staff will work to release solicitations to identify contractors for the other 13 communities outside of Central Long Beach.